Brigade President, Jim Wallace, who passed away on Thursday. Brigade and North West cricket in general suffered a blow yesterday (Thursday) after the sad passing of Jim Wallace. The Beechgrove President was a Brigade man through and through. 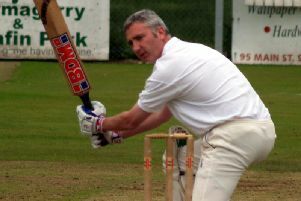 Wallace who played Boys cricket with Brigade before moving up through the ranks as wicket-keeper for the Firsts and then he captained the Seconds. During all his time with Brigade he was on the committee, where he held positions such as trustee, chairman and for the last 26 years he held the esteemed position as president. Although a massive Brigade supporter, Jim was also delighted to see North West players and sides do well in All Ireland, Provincial and on the international stage. Former Brigade Chairman Bertie Faulkner described Jim as a ‘Waterside and Brigade man through and through’. “Jim lived all his life in the Waterside and was at Brigade a lifetime,” he said. “He had a great wit and will be sorely missed not just with everyone at Brigade, but the whole cricketing community in the North West. To his devoted wife Violet, his four children Keith, Philip, Ian and Elaine and extended family circle, the sympathy of the community is extended.